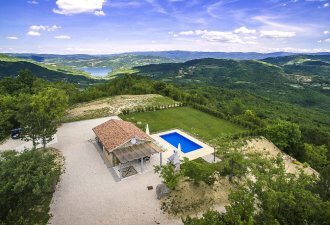 Villa Fresco is a beautiful example of combining traditional istrian and modern architecture, settled in an idyllic place surrounded by nature in central Istria, with a beautiful view of the picturesque town Draguc. The holiday home was built in a place where an older stone house used to stand, using a partially preserved and partially renovated wall of the older house which added a special charm to the house. It is important to higlight that in the remaining two houses in the village Baštini where Villa Fresco is locate lives nobody. urthermore, on the road which leads to the village there's no traffic at all so a quiet and peacefull holiday is granted. In about 10-15 minutes driving distance, you can find picturesque places with excellent restaurants offering traditional meals, a shop, bakery, ATM, pharmacy and other facilities you will find in the 11 km distant Buzet. The property is totally enclosed and offers an outdoor swimming pool of 28 sqm, a children’s playground with swings and a slide, a barbecue, a covered terrace with a dining table and three parking spots. Villa with swimming pool in central Istria with a surface of 133 sqm on two airconditioned floors. On the ground floor you there is a nice living area with equipped kitchen, dining room, living room and a shower/toilet. On the first floor there are three airconditioned double bedrooms. One of the bedrooms has a double bed, en-suite WC shower/toilet and a big terrace with a view of Draguc, the second room has two separate beds and the third a double bed. There is one more shower/toilet in the hallway.